I am an authority on management strategy, reality facilitation training, and am a world-renowned martial arts master who can provide solutions that empower audiences and corporate clients to turn challenges by demonstrating definitive working techniques guaranteed to bring about advantageous results. I am author of the best-selling interpretations of Musashi’s Book of Five Rings, Sun Tzu’s Art of War, along with The Living Tao, The Shogun’s Scroll, The Way of the Modern Warrior, and The Sword in the Boardroom, which focuses on business management, based on honesty, integrity, and morality for contemporary negotiations. I speak with true understanding of the lessons taught by the ancient masters and focus on the immediate needs of groups. My work is considered essential study for individuals and organizations interested in progressive management/motivation development that includes life enhancement skills. I am the founder of Self-Revealization Acceptance®, the first, foremost, and original reality facilitation concept ever presented to the modern world , guaranteed to bring immediate and permanent results. I am the author of Self-Revealization Acceptance – Your Divine Right to Live in Joy and Freedom and Practicing Self-Revealization Acceptance – 52 Weekly Ascensions to Empower Your Life. Acknowledged as a founding father of American Karate, I was elected to the title and rank of Hanshi, 10th Dan, the most prestigious accomplishment in the martial arts world, by international peer associations, in 1991. My martial arts system, Hebi-ryu Budo, is recognized by leading world martial arts masters to be one of the most realistic warrior methods in the world. I have received countless awards and honors for my work, including "most impactful international martial arts author of our time." 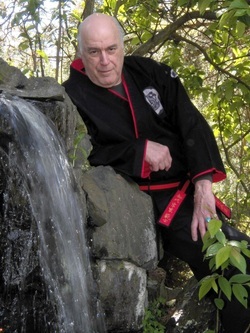 I have been involved with the martial arts world for 60 years. A lifetime of work, starting on Okinawa in the 1950’s while in the United States Air Force, includes teaching and practical experience with law enforcement agencies, NYC Board of Education, Dept. for the Aging, litigation firms, marketing groups, corporations, community centers, and private schools. Presently, I spend my time traveling, teaching, and writing. My seminars can be tailored for any audience or strategic situational objective.